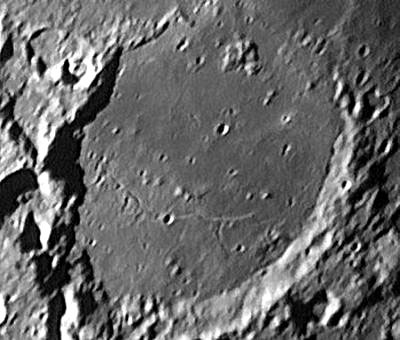 This is another one of the increasingly common amateur images that shows more than a Lunar Orbiter IV photo. John Sussenbach's great webcam image of Fracastorius seems to have about the same resolution as the Orbiter image, but John's lower sun angle brings out delicate rilles (to the far east and south) that aren't hinted at in the spacecraft view. This is, in fact, the best view of Fracastorius in existence. (I love to make statements like that in hopes that someone I've never heard of will send me an even better picture!) Well, what are those fractures? Most craters with fractures on their floors are called floor-fractured craters (duh); John's view of Gassendi is an example where the floor has been uplifted and rilled by an intrusion of magma from below. But Fracastorius's fractures have another origin. They apparently formed as the weight of Mare Nectaris lavas caused the center of the Nectaris basin to subside. John's image shows shorter fractures at right angles to the main one. Also, notice the two small hills on the southern portion of the crater's floor. I don't know why they are there - are they volcanic cones?? 15 September, 2003. C11, 3X Barlow and Toucam Pro. Yesterday's LPOD: Three Cheers for Three As! This page was last modified on 7 April 2015, at 01:04. This page has been accessed 1,341 times.